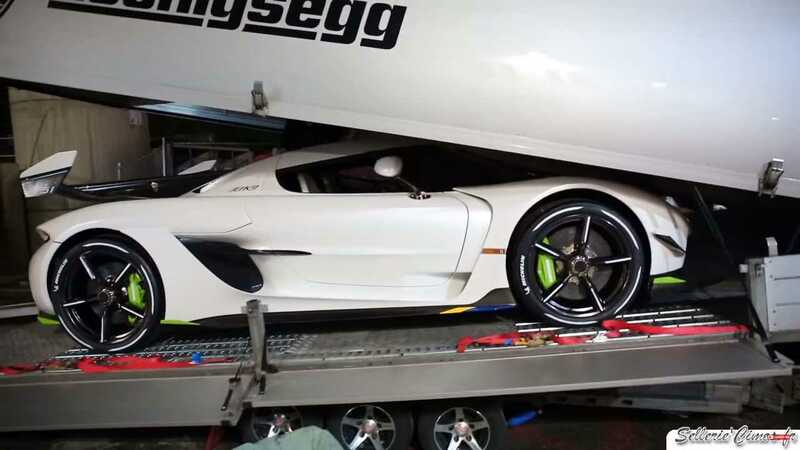 We’d rather see – and hear – it operating under its own power, but the video does give us some additional perspective on the size and the crazy aero components of Koenigsegg’s latest creation. With people pushing from the front and side, the car looks a bit smaller than it did on the stand during the show. It’s no less bonkers, however, from the huge front splitter to the boomerang-shaped center-mount rear wing and aggressive rear diffuser. Given the tight quarters in the lot, we can appreciate why the car was pushed instead of driven – rearward visibility from inside the car appears challenging at best. Beneath the Jesko’s skin is a twin-turbocharged 5.0-liter V8 making no less than 1,600 (1,193 kilowatts) horsepower when running ethanol-rich E85 fuel. Even on standard gasoline the Jesko still delivers 1,280 hp (955 kW), and it sends all that thrust through a new gearbox that Koenigsegg curiously calls the Light Speed Transmission. That’s because the multi-clutch nine-speed unit has the ability to jump directly between a range of gears, instead of bouncing through them like most sequential-type gearboxes.